In September 2000, HRW’s board of directors took a vote that still, a decade later, infuriates Sid Sheinberg, a legendary Hollywood mogul (he discovered Steven Spielberg) and current vice-chairman of the board. At the time, Bill Clinton was trying desperately to broker a peace agreement between Yasir Arafat and Ehud Barak, but one of the major sticking points was the right of return. It was an issue that even the most left-wing Israelis did not feel they could compromise on: If Palestinians were permitted to return to Israel en masse, it would imperil the country’s future as both a Jewish state and a democracy. Human Rights Watch was a product of the cold war. During the 1970s, Bernstein—who was president and chairman of Random House—had become interested in the plight of Soviet dissidents like Andrei Sakharov and Natan Sharansky. In 1978, three years after the United States and the Soviet Union signed the Helsinki Accords (which included language on human rights), Bernstein established Helsinki Watch, a group dedicated to monitoring human rights violations behind the Iron Curtain. In 1981, Helsinki Watch was joined by Americas Watch, which sought to expose the abuses of Latin American dictators, many of them quietly supported by the Reagan administration. “We were raising money from the right for Helsinki Watch and from the left for Americas Watch,” Bernstein remembers. Helsinki Watch and Americas Watch would become just two stars in a constellation of regional “watch committees,” all of which were brought under the Human Rights Watch umbrella in 1988. By the time Bernstein stepped down as chairman a decade later—he is now founding chairman emeritus—HRW had become a major force in international politics. Today, the group has a budget of $44 million, conducts research on about 90 countries, and churns out dozens of reports per year. It dispatches staffers to monitor human rights abuses around the globe, putting pressure on dictatorships like China, Sudan, and Cuba, as well as on democracies like the United States. To take just one example, it was frequently cited for its work exposing the horrors of Saddam Hussein’s regime. It is widely considered the gold standard in human rights reporting—an organization whose conclusions nobody can afford to ignore. Bernstein—now a gregarious octogenarian—had always considered himself a friend of Israel; but, for a long time, he didn’t follow events there particularly closely. Any Zionism on his part manifested itself mostly in regular contributions to the New Israel Fund—a left-wing NGO that finances Israeli human rights groups. But, as the Second Intifada erupted, following the failure of the Oslo process, Bernstein began paying closer attention to HRW’s work on Israel. And he didn’t like what he was seeing. Recent disputes over Israel inside HRW have frequently involved Sarah Leah Whitson, the 43-year-old director of MENA (and one of the officials who made the controversial fundraising appearance in Saudi Arabia). Raised by a mother who had been born in the Armenian quarter of Jerusalem’s Old City, Whitson spent summers as a child with family in Lebanon, Syria, and Jordan, later studying abroad in Egypt. Following law school, she became a corporate attorney but pursued activism on the side, volunteering for, among other groups, the American-Arab Anti-Discrimination Committee (where she was co-organizer of a delegation in 2002 that lobbied Kofi Annan to press ahead with a U.N. investigation of Israel’s Jenin operation) and MADRE (a women’s rights group, with which she traveled to Lebanon on a solidarity mission in 1996 after an Israeli bombing campaign). As I stepped into her office for an interview in February, I noticed that a poster for Paradise Now, a movie that attempts to humanize Palestinian suicide bombers, hangs on her door and that two photos of bereaved Gazans hang on her wall. Ken Roth was absent from the meeting—his daughter was graduating from high school that day—but he was furious when he found out. He immediately e-mailed Bernstein’s son Bill, a classmate from Brown, lamenting how unfortunate he found it that a man who had spent his life championing human rights had become an apologist for Israel. He appealed to the younger Bernstein to intervene, warning that his father would do great harm to the organization and to his own reputation. Shortly thereafter, Edith Everett was gone. At a MENA advisory committee meeting in March 2009, two months after the war in Gaza, she raised the subject of human shields with HRW senior military analyst Marc Garlasco, who was on hand to discuss the issues he and his fellow researchers were planning to write about: “I said, ‘I hope when you talk about the Palestinians in Gaza that you speak about their use of the population as human shields,’ and he was beginning to respond to that when Sarah Leah Whitson wouldn’t let him speak. She just put an end to that conversation. She said, ‘Well, in summation, I think we have to move on,’ or something, and I said, ‘This is ridiculous,’ you know?” Everett immediately tendered her resignation from both the HRW board and the MENA advisory committee. Just as the internal dispute over Israel was coming to a head, HRW found itself enmeshed in a bizarre controversy. On September 8, 2009, a pro-Israel blogger named Omri Ceren discovered that Marc Garlasco—one of the HRW staffers who had conducted field research on the Gaza and Lebanon wars—was an avid collector of Nazi paraphernalia. The revelation bounced around the blogosphere before quickly reaching the mainstream media. Already under attack from pro-Israel groups, HRW now found itself in a predicament. Initially, the organization came out swinging in Garlasco’s defense. But, within days, it changed course and suspended Garlasco. His suspension continued for months. (At one point during this period, according to a source close to him, he was contacted by HRW and told not to talk to me. When asked whether this was true, HRW declined to comment.) Eventually, HRW’s lawyers and his own hammered out a severance agreement, which included a nondisclosure clause. On February 15, he officially resigned. Steve Apkon was watching the entire episode with regret. Apkon liked Garlasco personally and respected his expertise. He thought that Garlasco—far from being a Nazi fetishist out to demonize Israel—actually had thoughtful views on the Middle East conflict. Both men lived in Pleasantville, New York, a quaint Westchester town, and they had gotten to know each other through Apkon’s film center, where one of Garlasco’s daughters had taken a class. Back in February 2009, shortly after Garlasco had returned from Gaza, the two met for coffee at the Pleasantville Starbucks (there is only one). Apkon found what Garlasco had to say striking: Garlasco told him that he had reservations about HRW’s approach to covering warfare, and specifically some of its work on Israel—including research for which he had been the point person. As it turned out, Apkon wasn’t alone. Garlasco is a complicated character—a gun-toting, beer-drinking Battlestar Galactica fan with a cloak-and-dagger persona like something out of a spy novel—and his views on HRW were hard to pin down. On the one hand, he publicly endorsed HRW’s reporting on Israel, telling TNR, “I stand by every report I ever worked on as a factual representation of the events.” And yet, he also criticized elements of this work to Apkon—and others. 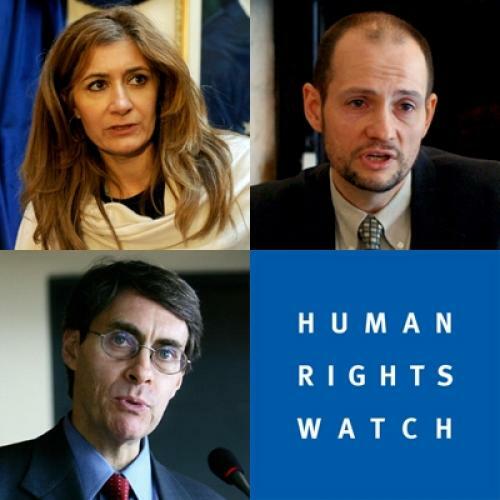 Beyond these disagreements, Garlasco had larger critiques of HRW. He thought that the organization had a habit of ignoring necessary context when covering war, he told Apkon; and he told multiple sources that he thought Whitson and others at MENA had far-left political views. As someone who didn’t have strong ideological commitments of his own on the Middle East, this bothered him. “When he reported on Georgia, his firm feeling was he could report whatever he wanted,” says one source close to Garlasco. “And, when he was talking to headquarters, the feeling was, let the chips fall where they may. He did not feel that way dealing with the Middle East division.” In addition, Garlasco alleged in conversations with multiple people that HRW officials in New York did not understand how fighting actually looked from the ground and that they had unrealistic expectations for how wars could be fought. To Garlasco, the reality of war was far more complicated. “He looks at that organization as one big attempt to outlaw warfare,” says the person close to Garlasco. Around the time he had coffee with Apkon last February, he was beginning to look for another job. In April, Bernstein made his case one last time at a board meeting, but, by this point, it was clear that he was not going to prevail. Six months later, he finally published his op-ed. The reaction from HRW was defensive; in a letter to the editor that appeared in the Times, the current and past chairs of the HRW board accused Bernstein of arguing “that Israel should be judged by a different human rights standard than the rest of the world”—something he had never said and clearly does not believe. Benjamin Birnbaum is a reporter-researcher at The New Republic.